Widow and orphan control! One of the more time-consuming elements of book design. Finicky enough on a normal book, but downright fun when you’ve got footnotes as well. What are widows and orphans? The image at the top shows an “orphan.” (From my work on Property Is Theft, coming out soon from AK Press.) 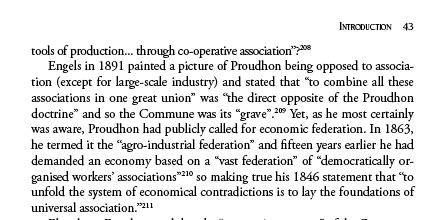 The line “tools of production… through co-operative association?” is isolated from its parent paragraph, which happens to be on the previous page. This is considered an error. figure 2: a terrible, wicked, evil orphan. This orphan is worse because it’s the only line of text before a large break and a new heading. It feels even more visually isolated. The widow above is the last line. It’s a single line of a paragraph before a page break (or a column break). Widows and orphans are considered errors in print design because it interrupts the flow of reading. You’ll actually find them a lot in mass-market paperbacks, once you develop an eye for it, but that’s because they’re poorly (or at least hastily) designed. There’s no way to complete automate the process of widow and orphan control. (note that the figure above also shows a second kind of orphan: a single word on its own at the end of a paragraph. This is considered an error in some publishing, and not others: when I worked with the Earth First Journal, we had all kinds of other text constraints. But in my book work, a single-word orphan is only considered a problem if it is shorter than the indent on the next line. Anyhow, the deal with widow and orphan control is that it comes last. After all the other layout decisions have been made and approved by everyone involved, after the text is finalized (but for a last proof-read, of course). Otherwise, you’ll have to do it all over again. Which isn’t so bad on a zine or something, but gets really, really annoying on a 300+ page book. 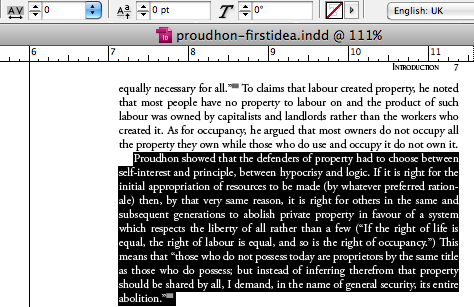 (or 800 pages, in the case of the proudhon reader these images are from). figure 4: a questionable orphan. 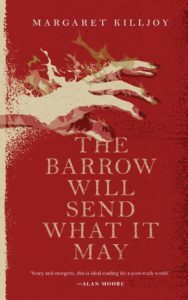 So… how to fix widows and orphans? In a word processor, you can just turn on “widows and orphans” and the program automatically re-flows the text to solve the problem. Why can’t you do that in InDesign? Because the way that Word or whatever solves the problem is by simply changing how many lines of text will be on the page. Fine for a printout, but not appropriate for a book, where lining up the last lines of text on every page is a task in itself. To my knowledge, you have to do this manually. Start at the beginning of the book and work your way forward, scanning the bottoms and tops of each page for widows and orphans. There are two main ways, that I know of, to control widows and orphans. One is to, if you are the editor or author of a piece, take out words or rephrase sentences in such a way that paragraphs are of different lengths and solve the problems. However, if you’re the lowly designer (or don’t want to change the text), you can do it with “tracking,” which is the space between letters and words. figure 5: an unaltered paragraph, with the tracking set at zero. figure 6: the same paragraph with its tracking at -10, saving a line of text. figure 7: the same paragraph with its tracking tightened to -50. Figure 7 shows the problem with tightening tracking: you can easily make text illegible. You can also increase the tracking so that the paragraph takes up additional lines. If at all possible, I stick to +10 and -10. Sometimes I go to +20 or -20, and in rare cases, when nothing else will work, I might go as far as +/- 30. I never go beyond that. You get better mileage by working with longer paragraphs: the cumulative effects of tightening the text is more likely to make more space. So you make your way through the book, tightening and expanding the tracking on various paragraphs to solve each problem as it occurs. It takes awhile. I actually enjoy this process: each page is like a little puzzle, usually with a simple solution, but occasionally offering more of a challenge. 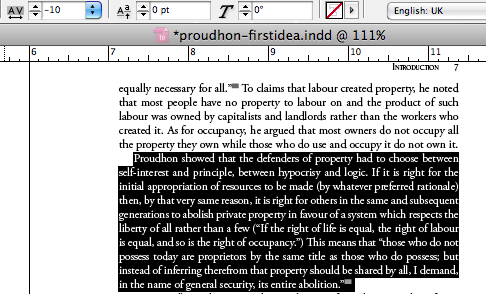 InDesign automatically places footnotes on the same page as their reference in the text (compared to endnotes, which go at the end of a section or book). This is a really handy feature, but can cause some problems. Sometimes, you’ll end up with entirely blank pages that seem inexplicable. Othertimes, you end up with a few blank lines at the end of a page before the next page, or odd things like that. 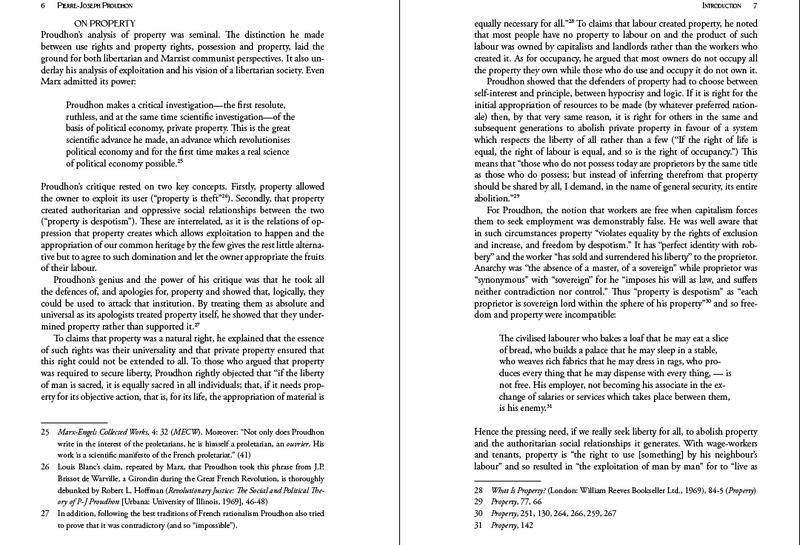 In Figure 8, the footnote referenced at the start of the right-hand page (referred to as the “recto” page in book design, as compared to the “verso,” left-hand page) has forced its way onto the right-hand page because there wasn’t room for its footnote on the left-hand page. As you do widow and orphan control on the main text (or, if you’re crazy, on the footnotes as well), you’ll change the text flow and cause all kinds of problems in terms of blank spaces. I personally don’t think a single blank line like in the above figure is a problem when fixing it would involve changing the tracking drastically throughout, but more than one blank line will definitely interrupt the flow of reading. I don’t have any specific advice on how to deal with this, except that it will take more time and more care. for someone who has no formal graphic design training but occasionally does layout on my own personal projects, this is very helpful and informative! thanks! Hi… do you know if it’s acceptable to have different line counts on facing pages. E.g. if you remove a widow/ orphan sometimes you wind up with some blank space at the bottom of one of the facing pages (i.e. the pages will no longer be ‘squared off’)… trying to get the squared off look without widows and orphans is proving to be quite painful! Hi, I had a question about your figure 8: is it made with Indesign? In this case, how did you manage to have a right indent for each footnote that doesn’t include the number of the footnote itself? 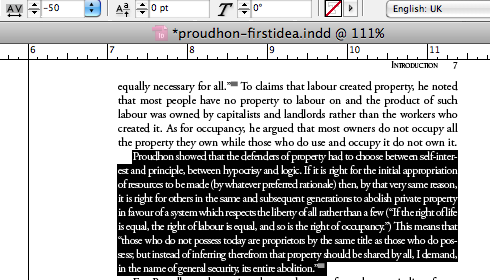 Word does it automatically, but in Indesign, when I apply a right indent, it is applied to all the footnote content, numbering included. hey there… I’m not entirely sure I understand your question, as I’m not sure what you mean by a “right indent.” but if you mean how everything but the footnote number is indented over, then yes, InDesign can do this automatically. You do it by editing the footnote style. Specifically, you set the whole paragraph’s left indent to be, I dunno, .1875″ or something, and then make the first line indent to be NEGATIVE .1875″. Then make sure that the tab character (in the tab pane of the footnote style) is also set to .1875″ (or whatever number you’re using). Thank you, a great help, I was about to give up.